The chair placecard holders have been featured in InStyle Magazine as one of the hot wedding items. 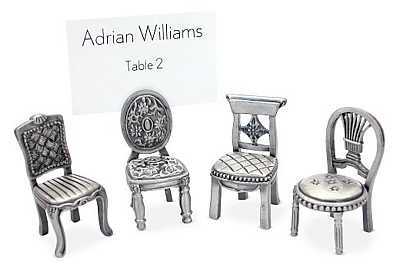 We have the chair place card holders in pewter. Your guests can now take a literally take a seat! These pewter chair place card holders are perfect for any event. They are just so cute. Price is per set of 8 chair placecard holders.